We’d love your help. Let us know what’s wrong with this preview of The First World War by Hew Strachan. Nearly a century has passed since the outbreak of World War I, yet as military historian Hew Strachan argues in this brilliant and authoritative new book, the legacy of the “war to end all wars” is with us still. The First World War was a truly global conflict from the start, with many of the most decisive battles fought in or directly affecting the Balkans, Africa, and the Ottoman Empire. Even more than World War II, the First World War continues to shape the politics and international relations of our world, especially in hot spots like the Middle East and the Balkans. Strachan has done a masterful job of reexamining the causes, the major campaigns, and the consequences of the First World War, compressing a lifetime of knowledge into a single definitive volume tailored for the general reader. Written in crisp, compelling prose and enlivened with extraordinarily vivid photographs and detailed maps, The First World War re-creates this world-altering conflict both on and off the battlefield—the clash of ideologies between the colonial powers at the center of the war, the social and economic unrest that swept Europe both before and after, the military strategies employed with stunning success and tragic failure in the various theaters of war, the terms of peace and why it didn’t last. Drawing on material culled from many countries, Strachan offers a fresh, clear-sighted perspective on how the war not only redrew the map of the world but also set in motion the most dangerous conflicts of today. Deeply learned, powerfully written, and soon to be released with a new introduction that commemorates the hundredth anniversary of the outbreak of the war, The First World War remains a landmark of contemporary history. To ask other readers questions about The First World War, please sign up. With the centennial of the onset of World War 1 upon us, I sought and found in this 2004 book a good choice for a one-volume history of the whole shebang. It is highly compressed into 340 pages, but is not wanting for covering the war in its world-wide aspect. With such a scope, we lose out on in-depth character assessment of major figures, but there are too many of them anyway. What we get instead is an effective framework of interpretation for hanging a lot of the facts and factions and sites of conflict. Each of ten chapters covers a theme, and in the process the reader is led to the perspective that for many of the participants the war was meaningful and worked to achieve the aims of big ideas. Strachan is no drudge; he has a point to make and a message to deliver. His desire is to take the cliché image of the war, particularly the English one—the war as Monty Python massacre, with idiot Graham Chapman generals sending gormless Michael Palin soldiers to a senseless death—and replace it with something more like the image that Americans have of our Civil War: a horrible, hard slog, certainly, but fought that way because no other was available, and fought for a cause in itself essentially good. In Britain popular interest in the First World War runs at levels that surprise almost all other nations, with the possible exception of France. The concluding series of Blackadder, the enormously successful BBC satirization of the history of England, has its heroes in the trenches. Its humor assumed an audience familiar with chateau-bound generals, goofy staff officers and cynical but long-suffering infantrymen. The notion that British soldiers were ‘lions led by donkeys’ continues to provoke a debate that has not lost its passion, even if it is now devoid of originality. For a war that was global, it is a massively restricted vision: a conflict measured in years of mud along a narrow corridor of Flanders and northern France. It knows nothing of the Italian Alps or of the Masurian lakes; it bypasses the continents of Africa and Asia; it forgets the war’s other participants—diplomats and sailors, politicians and laborers, women and children. With such losses, why weren’t there more voices to say “It’s not worth it; compromise in a negotiated peace”? Some seemed to think and believe that the massive loss of human life demanded total defeat of the enemy to make their loss worth something. Others would point to German and French intransigence over Alsace-Lorraine as the key barrier to Wilson’s 14 points for peace. Still others consider perpetuation of the war as bound to early visions of key leaders like Churchill on the spoils of empires that later got divided so richly in the Treaty of Versaille. I don’t get a clear answer on this question from Strachan, or else no dominant reason stands up as responsible for the tragic duration of four long years. He does make a point that only because the enough soldiers believed in the war and did not to mutiny was the war able to continue as long as it did. Strachan does put a dent in my comfort in the notion of inevitability of this war through reading that stopped on Tuchman’s “Guns of August” (1962). She implanted in my brain a picture of bumbling but warmongering empires which were so trapped by their nest of unstable alliances that of the assassination of the Archduke in Sarajevo represented effectively a random spark to start the conflagration. Yes, a lot of leaders were already planning for war, but Strachan emphasizes how the war the Germans and Austrians wanted in 1914 was a restricted one to settle the fate of Serbia and that they were genuinely surprised over Russia’s mobilization in response. And the apparent roll-out of the invasion of France according to the 1905 Schlieffen Plan was not significant as an inflexible script for the Germans in Strachan’s view. Strachan also dispels the notion that the onset of the war was driven in a meaningful way by imperial ambitions of Germany, Britain, and France. However, for many of the other participants brought in through the extended conflicts of the Austria-Hungary and Ottoman Empires, the territorial integrity as nations and motivations for expansion did serve as a prime motivator. I was able to learn a lot more about the fates in the war of Serbia, Poland, Ukraine, Bulgaria, Romania, Italy, and Greece and come to understand some of the causes and consequences of fighting taking place in Turkey, in Mesopotamia and Palestine in the Middle East, and at multiple sites in Africa. Obviously, just broad strokes, but vivid nonetheless. The First World War broke the empires of Germany, Russia, Austria-Hungry, and Turkey. It triggered the Russian Revolution and provided the bedrock for the Soviet Union; it forced a reluctant United States on to the world stage and revivified liberalism. On Europe’s edge, it provided a temporary but not a long-term solution to the ambitions of the Balkan nations. Outside Europe it laid the seeds for the conflict in the Middle East. In short it shaped not just Europe but the world in the twentieth century. It was emphatically not a war without meaning or purpose. Within Europe, Poland, Czechoslovakia, Hungary, Yugoslavia, Finland, and Lithuania had all achieved independence and a measure of definition before Woodrow Wilson even landed at Brest. …In Central and Eastern Europe war had effected change, and for those who sought such changes it continued to do so. Indeed, the United States’ own decision to intervene was confirmation of the same point. War could work. In a 2013 interview, Strachan warned planners of the centennial events that the commemoration was in danger of becoming sterile and boring. He calls for more than pity over a meaningless tragedy, and promotes discussion and education on a broader scope about the war. 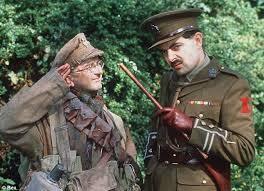 --Blogger (in History Extra): Is Blackadder bad for First World War history? I had seen the TV series that this book was based on and had to admit to myself that that was all I had to offer in terms of knowledge on the subject. So the book was going to be hopefully a more than useful beginner’s guide and it has turned out to be so. Each chapter was full of subject matter that made me realise I need to dig deeper into the Great War. The book itself covers mostly the political events and the major battles with the cultural events hardly covered. Fair enough I suppose. 330 I had seen the TV series that this book was based on and had to admit to myself that that was all I had to offer in terms of knowledge on the subject. So the book was going to be hopefully a more than useful beginner’s guide and it has turned out to be so. Each chapter was full of subject matter that made me realise I need to dig deeper into the Great War. The book itself covers mostly the political events and the major battles with the cultural events hardly covered. Fair enough I suppose. 330 pages cannot be enough to cover such a momentous event, an event that has had consequences even now, one hundred years later. As I beginner I found myself realising that from an English speaking perspective and living in Australia the vast majority of what little I did know was British and ANZAC. This book makes me want to expand to the eastern front and look further into the Russian Revolution. The French took a hideous smashing on the western front and that to needs further reading. I think that war weariness played a huge part in how they approached WW2. With that, anyone with deep knowledge of the subject may find this a bit too beginner friendly so I would not recommend it to the well-read. I also found a couple of indexing errors that should not have occurred and there is no bibliography though the footnotes do cover that area fairly well. A solid though not spectacular read and glad to have read it. I now understand the lure of the Great War to those that have immersed themselves into its dense written history. I wish I could rate this higher for what it does right, in particular Strachan's emphasis on events outside of the western front. However, his detached and judgmental style is grating. He likes to poke holes in "misconceptions" with such glee that he often fails to explain why the accepted view is wrong. This also makes it a rather poor introduction to the war, for it often assumes ample prior knowledge. The most intriguing assertion is that the rejection of the First World War's "true" meaning I wish I could rate this higher for what it does right, in particular Strachan's emphasis on events outside of the western front. However, his detached and judgmental style is grating. He likes to poke holes in "misconceptions" with such glee that he often fails to explain why the accepted view is wrong. This also makes it a rather poor introduction to the war, for it often assumes ample prior knowledge. The most intriguing assertion is that the rejection of the First World War's "true" meaning is what made World War II possible. I have issues with this, for he fails to acknowledge that the First World War was a tragedy due to the loss of life and political turmoil it wrought (20th century extremism was born in its wake). His weakest argument is that Germany did not have an agenda of conquest before 1914 despite a mountain of evidence to the contrary. An outstanding single-volume history and a remarkable feat of distillation and synthesis. When the 340 pages are finished, you're almost left feeling like it was too short. Serious students of history will be a little annoyed at the light sourcing, particularly when it comes to Strachan's confident dismissals of the conventional wisdom. A few of the conclusions seem a little too trite and one or two observations even flatly ludicrous, as here: "given that the United States was itself a community An outstanding single-volume history and a remarkable feat of distillation and synthesis. When the 340 pages are finished, you're almost left feeling like it was too short. Serious students of history will be a little annoyed at the light sourcing, particularly when it comes to Strachan's confident dismissals of the conventional wisdom. A few of the conclusions seem a little too trite and one or two observations even flatly ludicrous, as here: "given that the United States was itself a community made up predominantly of immigrants, Wilson's presumption against multi-ethnic empires was arrogant and naive" (333). Buku ini merupakan sebuah buku sejarah satu jilid (volume) mengenai Perang Dunia Pertama (1914 - 1918). Perang ini turut dikenali sebagai The Great War,yang bermula pada 28 Julai 1914 sehingga 11 November 1918. Walaupun bermula di benua Eropah dan memainkan peranan utama,skala peperangan melangkaui benua tersebut. Malah,peperangan ini turut melibatkan benua-benua yang lain seperti di Asia dan Afrika. Saya berpandangan bahawa buku ini merupakan sebuah buku ilmiah yang baik untuk dibaca. Terutamany Buku ini merupakan sebuah buku sejarah satu jilid (volume) mengenai Perang Dunia Pertama (1914 - 1918). Perang ini turut dikenali sebagai The Great War,yang bermula pada 28 Julai 1914 sehingga 11 November 1918. Walaupun bermula di benua Eropah dan memainkan peranan utama,skala peperangan melangkaui benua tersebut. Malah,peperangan ini turut melibatkan benua-benua yang lain seperti di Asia dan Afrika. Saya berpandangan bahawa buku ini merupakan sebuah buku ilmiah yang baik untuk dibaca. Terutamanya kepada mereka yang mahukan sebuah buku 'pengenalan' mengenai Perang Dunia Pertama yang mungkin semakin dilupakan,terutamanya oleh generasi kini. Pada tahun 2014 yang lalu,usia peperangan besar ini telah mencapai 100 tahun! Berani saya katakan,tiada pendedahan baharu yang didedahkan penulis. Seperti hanya sebuah ringkasan dari kajian-kajian terdahulu. Namun demikian,maklumat yang dipaparkan di dalam buku ini masih bermanfaat untuk dibaca terutamanya kepada mereka yang kurang arif. "There is a faraway moan that grows to a scream, then a roar like a train, followed by a ground-shaking smash and a diabolical red light... Everybody simply shakes and crawls... A hunching of the shoulders and then another comes, and the thought - How long, how long? There is nothing to do. Whether you get through or not is just sheer chance and nothing more." Hew Strachan is sniffy. He's sniffy towards fellow academics. He's sniffy towards the conduct of certain WW1 operations. He' "There is a faraway moan that grows to a scream, then a roar like a train, followed by a ground-shaking smash and a diabolical red light... Everybody simply shakes and crawls... A hunching of the shoulders and then another comes, and the thought - How long, how long? There is nothing to do. Whether you get through or not is just sheer chance and nothing more." Hew Strachan is sniffy. He's sniffy towards fellow academics. He's sniffy towards the conduct of certain WW1 operations. He's sniffy towards early 20th century liberalism. He's outright incandescent at those who believe the Great War was fought without purpose or meaning. Strachan spent years researching and writing this book labeled Volume I: To Arms. I gave up at page 382 of 1139. I felt like I was interrupting the author and reading his notes over his shoulder. It seemed like every discussion by every office-bound was detailed; every turn of every unit of the multitude of armies was mentioned by commander and cardinal direction. You cannot even tell which country the units represent when in the Russian-German front the commanders of two groups on the same side Strachan spent years researching and writing this book labeled Volume I: To Arms. I gave up at page 382 of 1139. I felt like I was interrupting the author and reading his notes over his shoulder. It seemed like every discussion by every office-bound was detailed; every turn of every unit of the multitude of armies was mentioned by commander and cardinal direction. You cannot even tell which country the units represent when in the Russian-German front the commanders of two groups on the same side are named Francois and Mackensen. The information to understand these details are never given. I did not know, before starting, the sizes of all the subdivisions of armed forces in all the countries involved and the author does say they differ by country. What was I to make of statements like this: "Germany's success was defensive; the Russian army, despite the loss of 310,000 men in the opening six weeks, had not suffered a crippling blow." That is the total explanation given by the author. The introduction is the best part because there is some summarisation and analysis not just a core dump of details. This is an excellent, but dense, book. While only 340 pages (far fewer than the average World War I history), it is so packed with information that I had to read slowly and often reread, just to get the gist of it. In fact, 130 or so pages in, I saw some handwritten notes I had made in the margins: I had read this book before, but hadn't realized it until that moment! Whether the cause is the density of the writing or my own faulty memory, who's to say? But what I liked best about this book is th This is an excellent, but dense, book. While only 340 pages (far fewer than the average World War I history), it is so packed with information that I had to read slowly and often reread, just to get the gist of it. In fact, 130 or so pages in, I saw some handwritten notes I had made in the margins: I had read this book before, but hadn't realized it until that moment! Whether the cause is the density of the writing or my own faulty memory, who's to say? But what I liked best about this book is that the author clearly has an understanding of the motives behind the decisions, the reasons for the actions, and the underlying reasons for the conditions. This is not a litany of facts, but a keen analysis of the causes, the developments and the results of the war. Two sentences, selected at random, support this: "Kitchener, the British secretary of state for war, was inclined to agree: for him the purpose of the Salonika expedition was less to help the Serbs than to provoke the Greeks to do so." And, "The Bolsheviks published the secret agreements on war aims reached between the Entente powers: Britain, France and Italy stood convicted, it seemed, of annexationist ambitions comparable with those of the monster which they were pledged to extirpate, German militarism." Nearly every page contains this kind of commentary and insight. Catching up on some of my off and on reading. This book was available for Nook download not long ago at $5, so I opted to try. I would say that along with John Keegan's The First World War, one of the better one volume histories of the war. The writing is clearly better than Keegan's. The narrative is more lively and in the moment. Although I enjoyed the book, I still have not found a better book on World War 1 than Paul Fussell's The Great War and Modern Memory. For me, that book is the gold sta Catching up on some of my off and on reading. This book was available for Nook download not long ago at $5, so I opted to try. Although I enjoyed the book, I still have not found a better book on World War 1 than Paul Fussell's The Great War and Modern Memory. For me, that book is the gold standard for understanding the war and its impact. Tanto per cambiare, eccessivamente anglocentrico. Certamente interessante, anche ben scritto, ma troppo orientato solo e soltanto sul fronte occidentale (senza dubbio il fronte più importante) o laddove hanno combattuto gli inglesi. Scarsi (troppo, veramente troppo) i riferimenti al fronte italiano o a quello orientale. An excellent, compelling summary of a long ans complex conflict. This book taught me a lot, especially about war outside the western front. It's basically a cliff's - notes of World War I. There is a lot of information and much of it is interesting, but the writing is so dry. It almost took me the same amount of time to read this as it did to read The Sleepwalkers and that book is almost twice as long. This book is okay, but the accompanying video series is much much better. I also don't know if I agree with Strachan's assessment that the war in general, or the Treaty of Versailles in particular, didn't make the second world war ine It's basically a cliff's - notes of World War I. There is a lot of information and much of it is interesting, but the writing is so dry. It almost took me the same amount of time to read this as it did to read The Sleepwalkers and that book is almost twice as long. This book is okay, but the accompanying video series is much much better. I also don't know if I agree with Strachan's assessment that the war in general, or the Treaty of Versailles in particular, didn't make the second world war inevitable. I definitely believe that if you don't have the first, you almost certainly don't have the second. 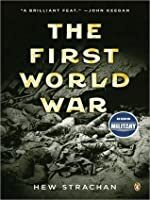 I finished this book on Armistice Day! How fitting. This book was chosen as the anchor for my class on WWI but I'm not sure that it's the best book to use when learning about the subject. To me it seemed to focus on vague specific topics in not so much of a chronological order. For a short history on WWI I felt like it should cover the basics a little better giving you an idea of the who's and what's in the order in which they happened. Excellent one-volume history of WW1, comparable to Andrew Roberts' work on WW2. Highly recommended- especially for those unfamiliar with the subject. Good read on the first wolrd war, good coverage of all the key generals. 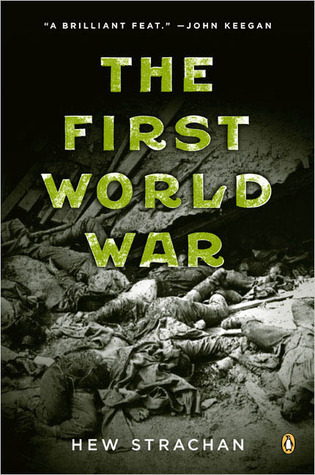 I read The First World War by Hew Strachan mostly because it was recommended by the Army Chief of Staff. I also realized that my knowledge of WWI is woefully inept considering I have a history degree. I took a class on World War II and the US Civil War. There are dozens of movies about WWII and the Civil War. We joke about the days in which the History Channel showed only profiles of Hitler, as opposed to Ancient Aliens, as a sign of the times. Outside of of the tales of Diana, Princess of I read The First World War by Hew Strachan mostly because it was recommended by the Army Chief of Staff. I also realized that my knowledge of WWI is woefully inept considering I have a history degree. I took a class on World War II and the US Civil War. There are dozens of movies about WWII and the Civil War. We joke about the days in which the History Channel showed only profiles of Hitler, as opposed to Ancient Aliens, as a sign of the times. Outside of of the tales of Diana, Princess of Themiscyra, I know very little about WWI. Considering that this year is the centennial of Armistice Day, the cease fire that ended the war, it seemed exceptionally appropriate to read this book this year. Before reading this book I knew only a few things about WWI. It was "the War to End all Wars" or "the Great War". It ended on "the eleventh hour of the eleventh day of the eleventh month." I knew that the improvements to weaponry, due in large part to industrialization, led to trench warfare. I knew that it was the first use of machine guns, tanks, airplanes, chemical weapons. I knew the Maginot Line was a joke [It technically worked; the Germans went around it so it was never breached]. I knew that the Treaty of Versailles was a primary cause for WWII. That was about the extent of my knowledge, just a collections of anecdotes and sayings. This book changed that. The first thing I noticed about this book is how thorough it is. Listening to The First World War was very much like sitting in a lecture hall and listening to a WWI scholar talk about the the war, the factors that led to it, and the impact in had. Now, something that I feel sets this book apart is that the author does a phenomenal job of including details and anecdotes of what happened in addition to the actual fighting. He discusses the economic and political implications and how they affected the average civilian farmer, for example. This is not common in books about war and really makes this book stand apart. Another great aspect of this book was how it applied equal representation to all facets of the war. What I mean by that may be a greater reflection of my own ignorance than anything else but, this war was far more reaching, in scope, than I previous knew. Again, my own ignorance at play here, but I never really comprehended that WWI was in fact a "world" war. I only recall learning about the war in Europe. Sure, we have the eventually inclusion of the US and fighting in Turkey, which is half-Europe, but I did not realize how much more global the war reached. The most obvious example of my ignorance was all the fighting that took place in Africa. Overly simplified, it makes perfect since that there would have been fighting on the continent, most of the European powers had African colonies. What I really did not know was the contributions of the African people to the war effort. Africans fought on both sides of the war and the Germans did not surrender until two weeks after the armistice. WWI ended German colonialism though the colonies were divided among the powers to the Entente, not granted independence. This book was not perfect and while I do enjoy the lecture type presentation, it reminds me of my favorite professor from college, at times it made it very possible to zone out. That is really the only criticism I have to this book. Had it not been due back to the library, I would have slowed down and taken the book in chunks. The First World War is not a dense book in the colloquial sense but it is information-dense. There is a lot to learn and process. It is a great book and I recommend it to anyone who likes history. One need not appreciation of military history to enjoy the First World War as the book is so well written and all-encompassing. This book took me almost a year and a half to get through! ALthough, I hasten to add, not because of it, because of my reading habits. Firstly, I'm not a natural non-fiction reader (I'm getting better) and put it off for fiction, but also, I've had a bit of an eventful time throughout. I originally purchased it after realising, to my shame, that I got events from WWI and WWII crossed over and which commemorative services conrresponded to which war. I also found the history of western civilisation This book took me almost a year and a half to get through! I also found the history of western civilisation more interesting after the events of Brexit and the US presidnatial elections that allowed Trump in. I studied the rise of Nazism between the two wars and, after feeling the familiarity of fascism potential in the US and UK, I wanted to have what I was thinking in my mind a little fresher tha something I studied 20 years ago. So, I bought three books, one of WWII, one of the rise of fascism& Nazism in EUrope just before WWI, and this one (I have also bought books on the rise and fall of the British Empire and so on, just to compund my understanding of the odd sense of Empiric superiority it seems some british folk still have (and hanker back to)! I enjoyed this book, and it's narrative on how it all came about was very clear and conscise. It also helps one understand what a melting pot of political confusion Europe and it's surroundings were leading up to the break out of war. In hindsight, it looks like it couldn't have been more obvious, but it is noted elsewhere nowadays how it is very hard to see in hindsight when things are happening *now* (so you can see how you hear how people worry about what is happening around the politic corner). The descriptions of how the war effected other non-European countries is also interesting and leads very smoothly into how the longevity of the war effectively caused the end of it, in many ways). I would have liked there to have been a longer chapter on it's aftermath, but I guess you need to read another book on that. It certainly leaves you feeling that not evething is sorted (and it really really wasn't), but nothing ever is in world politics. This book isn't quite a 4 for me and I wish I could give a 3.5 (or a 3.75) because it really isn't a straight 3. Having read several books about World War I since the 100th anniversary of its outbreak in 1914, my immediate response to seeing this was 'why would I want to read another one'? But there was something about its conciseness that drew me to it - many other books on the war are very long. It wasn't just the conciseness of its 330 pages; a quick browse showed that Hew Strachan's writing style was also concise. But most of all, I was drawn in by his central thesis that characterisatiuons of World Wa Having read several books about World War I since the 100th anniversary of its outbreak in 1914, my immediate response to seeing this was 'why would I want to read another one'? But there was something about its conciseness that drew me to it - many other books on the war are very long. It wasn't just the conciseness of its 330 pages; a quick browse showed that Hew Strachan's writing style was also concise. But most of all, I was drawn in by his central thesis that characterisatiuons of World War I as a tragic, pointless conflict - as opposed to the noble crusade against Nazism and Japanese militarim that World War II was - are false, or at the very least misleading and an over-simplification. In those 330 concise pages, Strachan demolishes that thesis, showing that it was an interpretation that arose in the decades following the war. For many of the soldiers, fighting the war was a genuine duty - France, for example, was effectively invaded by Germany, so many French troops were defending their homeland. The sentiments expressed by British war poets about the waste of life etc were genuine, but not the view of all soldiers at the time of fighting, by any means. Armistice Day was celebrated for many years immeidately after the war and it was only by the 1930s that the 'tragic, pointless conflict' view came to the fore. Another relevant point Strachan makes is that Germany didn't actually lose the war in a full military sense. It would have, eventually, of course, but when it signed the Armistice no German territory was in Entente hands and it was the threat of revolution at home in response to conditions there, as well as knowing Germany would eventually lose, that convinced its leaders to agree to the Armistice. While making these points, Strachan never denies that the war was a terrible tragedy and his perspective is valuable. If your time is limited and you only want to read read one or two books on World War I, this should be one of them. Like many of the other readers who posted comments, I am impressed by Hew Strachan's mastery of so many of the intimate details of the War. I had little real background on World War I and wanted to learn much more. I was interested to see Mr Strachan refute the notion, which I've always heard, that the War caused a lost generation when in fact population recovered by mid 1920's (at Introduction on very first page). I also was interested to see Mr Strachan's explanation that defensive trench warf Like many of the other readers who posted comments, I am impressed by Hew Strachan's mastery of so many of the intimate details of the War. I had little real background on World War I and wanted to learn much more. I was interested to see Mr Strachan refute the notion, which I've always heard, that the War caused a lost generation when in fact population recovered by mid 1920's (at Introduction on very first page). I also was interested to see Mr Strachan's explanation that defensive trench warfare actually saved lives (p 164), given the new advanced weaponry, busting my layperson's bias that it fed into the carnage. I learned much from Mr Strachan's discussion of the homefront political and labor issues including all the strikes as well as the role of women in the workforce. I also learned a bit more about the German outrage regarding the terms of peace. One key item on which I did NOT see much coverage was Germany's use of poison gas as an offensive weapon - I would have expected a discussion of how a civilized nation decided this was a viable option for the Western Front. A good place to start reading about the First World, giving the reader an outline of the conflicting military and national interests that led up to the start of the war, the battle lines, the main battles and the consequences of the war for the landscape of Europe and the rest of the world for the rest of the 20th century. It is hard to follow in places, Strachan spends half a chapter explaining why it made little military sense for Germany to launch attacks on the Western Front before going str A good place to start reading about the First World, giving the reader an outline of the conflicting military and national interests that led up to the start of the war, the battle lines, the main battles and the consequences of the war for the landscape of Europe and the rest of the world for the rest of the 20th century. It is hard to follow in places, Strachan spends half a chapter explaining why it made little military sense for Germany to launch attacks on the Western Front before going straight into a description of the battle of Verdun (a German attack), elsewhere he describes the Battle of Jutland as being between the "Grand Fleet" and the "High Seas Fleet"; you are expected to know which side is which. It was interesting to hear that Generals on both sides would say different things at different times: they would talk about the "War of Position" when launching a grand attack, but would switch to theories about the "War of Attrition" and "exhausting the enemy" when those attacks became bogged down, as they so often did. As other reviews have noted this book does have a "Well, actually..." tone that assumes some prior knowledge of WWI. That didn't bother me too much and I mostly enjoyed the rebuttals to conventional wisdom that were presented. Great photos but I really wish this book had included some additional maps instead of the very general ones at the beginning of the book. Especially when it came to naval battles I found the long descriptions of which ship/unit was on which flank very difficult to follow a As other reviews have noted this book does have a "Well, actually..." tone that assumes some prior knowledge of WWI. That didn't bother me too much and I mostly enjoyed the rebuttals to conventional wisdom that were presented. Good book with lots of depth on the behind the scenes of he war. This is not a book about the battles. Which is just what I was looking for. If any criticism can be made, it reads more like a text book than a novel. Again, not bad. This is a history book after all. If your looking for a history of World War One, behind the scenes, and not about battles, tactics, strategies, then this is the book for you. An excellent book that covers all theatres of the war in good depth. I found that some of the content can get kind of dry, but there is still plenty to learn if you want a good overview of World War 1. For someone who loves detail concerning artillery this is the book for you! Seriously, I learned more about the governing bodies and their interaction with multiple parts of the world than from any history studied in school or university.